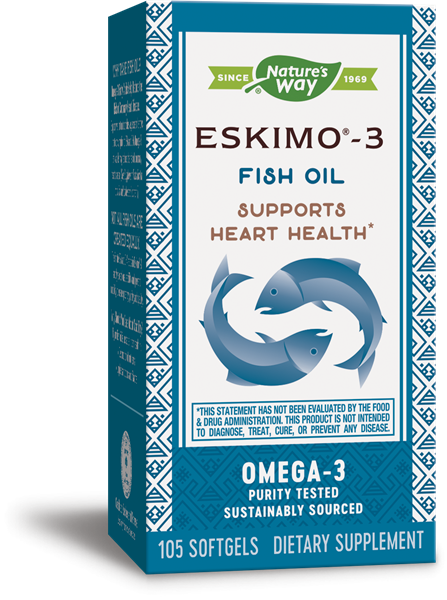 Eskimo-3® Fish Oil 500 mg / 105 softgels - Nature's Way®. Omega-3 Fatty Acids Help Reduce the Risk of Coronary Heart Disease. The innate EPA and DHA ratio in Eskimo®-3 supply exceptional stability and prevent rancidity to ensure Potency, Purity, and Quality. Take 3 softgels with meals, one to three times daily. If taking any medications, consult a healthcare professional before use. Eskimo®-3 contains fish oil, which is a food source that may be utilized when following a kosher diet. It does not contain ingredients from crustaceans, which are NOT permitted in kosher diets. This product is also in a bovine source gelatin capsule. Because the cattle were slaughtered according to Jewish law (shechitah), the gelatin is kosher. Therefore, the Eskimo®-3 is considered kosher. What type of fish are used in Eskimo®-3? How are they harvested? Enzymatic Therapy is committed to the sustainability of the planet's resources. Eskimo®-3 is obtained only from non-endangered species of cold-water fish (herring fishes, including anchovies and sardines) harvested from areas not subjected to over-fishing. Not only are fishing times limited to certain days and certain seasons dictated by federal authorities, but the fish population is closely monitored on a continuous basis. During open fishing seasons, official quotas are established and each fishing vessel is audited. Each vessel must be registered and equipped with a GPS (global positioning system) transmitter to ensure accurate tracking. These measures help ensure that the fish populations stay at sustainable levels. Contains soy and fish (anchovy, sardine, mackerel).